St. Martin's Paperbacks, 9780312997021, 304pp. When New York theatre impresario Tommy Burke asks Molly Murphy to help him take care of some family business back in Ireland, Molly is happy to oblige. Tempted by the prospect of going home for the first time in years (and putting her fledging detective agency on firm financial ground), Molly throws caution to the wind and climbs aboard the White Start Liner "Majestic" with hopes of sneaking on and off the isle without raising a peep. Until one passenger, who happens to be a famous Broadway actress goes missing and another turns up dead. So much for smooth sailing . 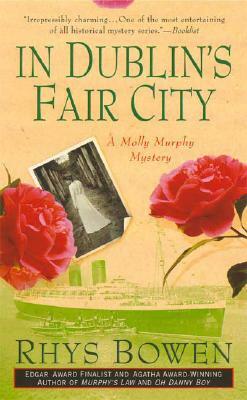 Rhys Bowen is the author of the award-winning Molly Murphy and Constable Evans mysteries. Her novels have garnered an impressive array of awards and nominations, including the Anthony award for her novel "For the Love of Mike" and the Agatha Award for "Murphy's Law." Her books have also won the Bruce Alexander Historical Award and the Herodotus Award, and have been shortlisted for the Edgar, the Agatha, the Macavity, the Barry, and the Mary Higgins Clark Award. She has also written "Her Royal Spyness," a series about a minor royal in 1930s England, and she is the author of several short stories, including the Anthony Award winning "Doppelganger." Her story "Voodoo" was chosen to be part of the anthology of the best of 50 years of "Alfred Hitchcock Mystery Magazine." Ms. Bowen was born in Bath, England, and worked as an announcer and studio manager for the BBC in London, before moving to Australia and then California. It was here she started writing children's and young adult novels, and then moved on to mysteries with the Constable Evans novels. When not writing she loves to travel, sing, hike, play her Celtic harp, and entertain her grandchildren. She lives in San Rafael, California."